Ride summary: Ride the rollers out of Urbana. Whee! First control in Union Bridge, Maryland. Pedal pedal. Climb 77 in Catoctin National Park. Climb. Climb climb climb. Descend. 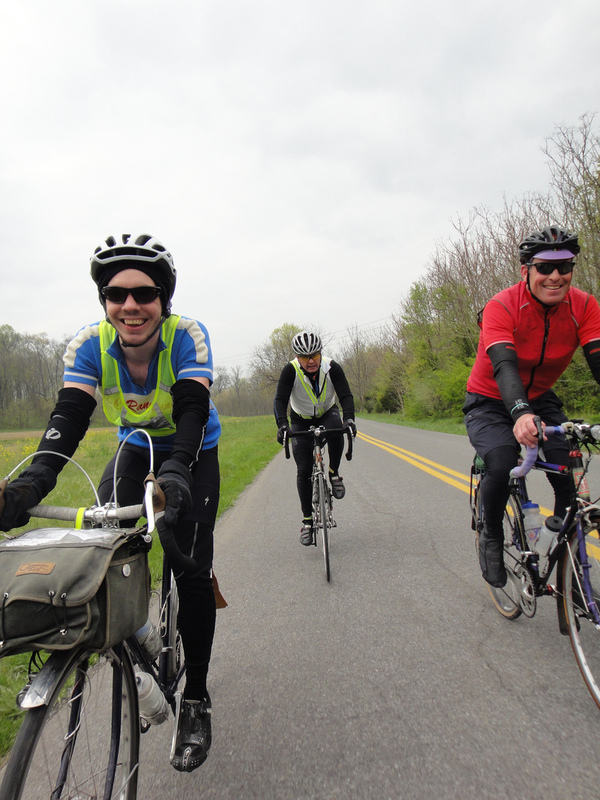 Grind through the rollers out of Smithsburg. Stop for a couple pics. Pedal through the fragrant countryside. Whoah, stinky! See eight cats in someone’s driveway. Eight! Control in State Line, Pennsylvania. Eat half a sandwich. Hello rider. Hello rider. Hello rider. Pedal pedal pedal. Kemp’s Mill Road, a friendly zippy stretch. Control at KOA. Hello Lowell. Hello Severna Park. See end of cooking show about brownies. Depart control. Mosey to Sheetz. Eat an almond butter and jam sandwich. Drink a latte. Meet up with fleche teammates Lane, Mike, and Eric, as well as Scott G. and Alec. Chat and laugh. Ride. Information control in Antietam. The question is… just kidding! It’s a secret! Ride ride. Bonk. Battleview Market control. Eat chips. Contemplate life. Pedal pedal pedal. Trego, bleah. Climb climb climb. All alone with Ed. Gapland finally! Lane waited. Thanks! Descend whee! Pedal pedal pedal. Eric waited. Thanks! Marlu Ridge the easy way! Group ride with Mike, Eric, Lane. Chat. Listen to Mike. Fingerboard. Slog slog slog. Finish. Photo op by Bill. Pizza pizza pizza. Yeah. I’ve never had a lot of love for the Urbana 200K, even though it was the first brevet I ever rode. It’s a good ride and an honest challenge, but for some reason I have always found it somewhat unkind. It’s a pretty hilly course, and doesn’t offer too much reprieve. It also doesn’t offer too many food stops along the way. That’s not a big deal, I’m not hoping for Zagat-rated dining during my brevets, but I think all of the climbing on the route and the limited places for food make for a tougher ride. This was my first ACP brevet of 2012, as I missed the other D.C. Randonneurs 200K two weeks ago and ran the D.C. marathon instead. I worried about my conditioning, but it ended up being fine. The ride was hard, but my body held up well physically. My emotional state throughout the ride was a little different matter, and directly correlated to my food intake. This was probably my hilliest ride of 2012 to-date, and I did not eat enough to get through it. I had a hard time eating any breakfast before the start. I brought along two almond butter and jam sandwiches, which I ate, as well as two Clif bars and two packages of Clif shot blocks that I gnawed on throughout the ride. I also bought (and ate) two bags of potato chips. While that might be enough for some people, it didn’t seem sufficient for me. I made it to the midpoint of the ride without too much fatigue, but after that I found myself ebbing in and out of bonklandia for the remainder of the day. The ironic aspect of my bonking, though, was that I lost my appetite and nothing sounded tasty. Then I felt weepy and began emotionally imploding. Thank goodness this was just a 200K. I always feel like I’m starting from square one when I do my first ACP brevet of the year. Maybe next year I won’t feel like such a novice. The Urbana 200K course is always tough. Food is your friend, especially on hilly rides. Crying is no way to spend a bike ride. Felkerino has a lot of patience. Getting in with a good group helps the miles pass, even (especially?) on the more unforgiving segments. I took pictures. Want to see them? I believe they mask most of the discomfort, bleariness, and fatigue I experienced. Smiles everywhere! Just click here. P.S. Sorry for the Foreigner reference. I just couldn’t help myself. Scenery looks nice, cows look pleasant, hills look absolutely horrible. Sounds like one of those rides you only start to enjoy once it is over. my learning this year was to print out the cue sheet, mark the climbs, and also instruct myself to EAT every 12 or so miles. Our first ACP200k hurt this year (new route). Good on you for getting through it! You and Ed are killing me. Based on your posts, you have already done a Fleche, that’s just great. Though, I have to remind myself you and Ed live in DC. Overall much warmer than Naperville, IL, which is 30 miles from Chicago — despite the warm weather we have gotten in March. I’m doing a Fleche in May, then the National 24-hour Challenge (http://www.n24hc.org/) again for the third time in June. Other than that, not much else this year, after doing PBP last year. Thanks for all your posts, say hello to Ed. All the best — Rick — I’ll be in touch. PS – Despite doing PBP, and I’ve been to France before, Europe overall too, was riding to Chartres with you and Ed — that was really a fun day, in some ways better than PBP. Thanks again for that! Rick, so great to hear from you, and yes, the Chartres trip was just the BEST! We have not yet done the fleche; it’s happening in two weeks. However, our club has its first ACP 200Ks on the schedule completed. I was just talking w/ someone in Florida where they just finished their full SR series! I think you and Ed will find this to be very interesting. So, one last comment today, in case you and Ed are not aware. I’ll try and keep this short. When we rode to Chartres, one guy who rode with us, his name was Jeff, if I recall. He rode a fixed, and had very long hair, nice guy too. Anyway, I asked him, if he knew Bryce Walsh, He said he did, since they both have done RAAM. Anyway, Bryce did PBP last year for the third time. But, now he quit his job for a major riding adventure — and he’s not a rich guy. He’s riding the Tour of Africa, a 7,500 mile stage race from Cairo to South Africa. He started in Jan., and it ends in May. Sounds hard, sounds great! Until you realize, that’s just the beginning. After the Tour of Africa, he comes back to the states to ride/race the Great Divide MTB race. Basically, he’ll be riding over 10,000 miles, in around 7 months time. If it were not for that guy Jeff, I probably would not have mentioned it on your Blog — still I thought you would be interested. Holy cow, that is incredible! I’ll have to follow vicariously. You get weepy when you bonk? I start to fall asleep. Weird, no. Yawn. Head starts to bob up and down like Mr. Met in the back of a 1964 VW Beetle. I can appreciate the food thing too. On every tour I’ve done, I come to a point where I need to eat and NOTHING is appealing. I really hate forcing myself to eat. two bags of potato chips?…. 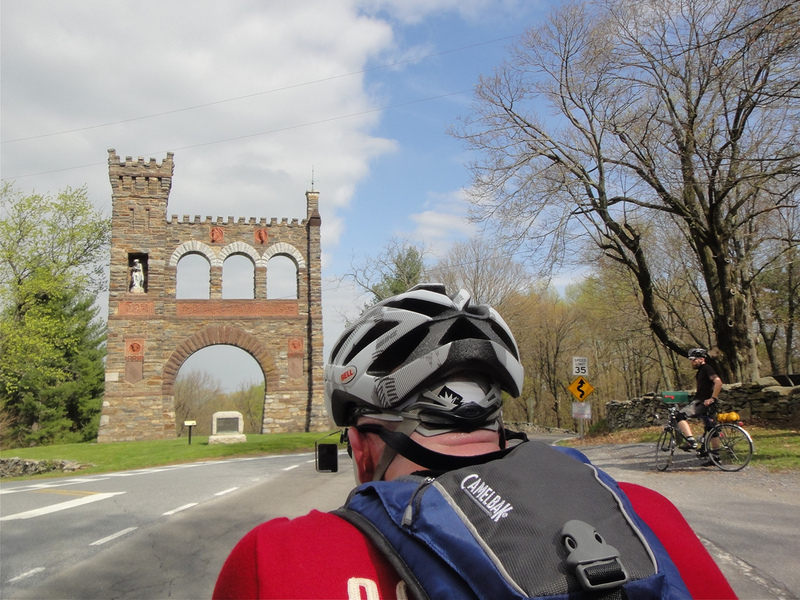 I find it amazing that the Urbana was your (and Eric’s) first brevet– and that didn’t deter you from doing more since! I still think you’re amazing for doing a marathon a couple weeks before, and then doing this hilly 200K! I also get weepy and cranky when I bonk. I ate as much as you did, and I was also still hungry, which had baffled me. My one regret was that I didn’t buy a Reeses Easter egg at one of the controls. Yes, you totally deserved that Reeses Easter egg!! Congratulations to you on getting through such a challenge, Lisa! I totally admire you and enjoyed reading your story. Nice report. Sorry to have missed it, but plan to make the next Brevet. You’re a machine, M. I love reading about your randonneuring and seeing the similarities to ultrarunning. When I bonk hard, I lose my appetite and feel queasy too. I love that randonneurs get weepy and emotional too. Endurance sports are great – one can experience all the beauty, drama, giddiness and tragic hopelessness of a grand opera! Sounds like a tough brevet. Congrats on pushing through. And the amount of food you ate does not sound like enough to me! I’m quoting you on your interpretation of endurance sports. A grand opera. It’s TOO PERFECT! My first brevet of this season was a ROMA 200K that used to be called the Polar Express. Like other ROMA rides there were no volunteers, lots of hard rollers and an Exxon for “food”. Mercifully, I found a subway in Timberville that carried me to the final control and the seven miles home. I vow to thank every volunteer I see, to help when possible, and be grateful for each bit of food that does not come from a stinkin’ convenience store. That was definitely a take-away for me, too. We are so fortunate to have regular volunteers in D.C. Rand and the rides often have stops that include non-convenience store food along the way. Look forward to seeing you on a ride soon, Mark!